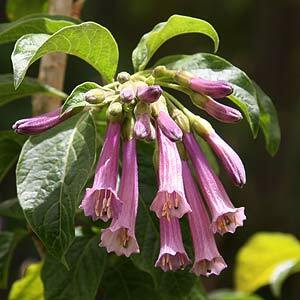 If you are looking for a long flowering evergreen shrub then Iochroma could well be it. Masses of tubular flowers from summer to autumn make a colorful display. Iochroma plants and species such as the blue flowering Iochroma cyaneum and the orange flowering Iochroma coccineum will generally grow to 2-3m. The tubular blue flowers of the evergreen Iochroma coccineum along with large attractive felt like leaves make this a most attractive plant for the garden. Over recent years a few new developments including the discovery of a wonderful white flowering ‘Wooly White’ give the gardener even more flexibility in terms of colour. All of these colors are available for sale from specialist and rare plant nurseries. 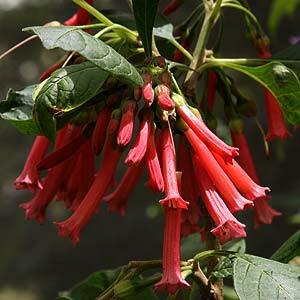 Iochroma are originally from South America and prefer a warm sheltered position in full sun to part shade. A moist well drained position at the back of the border is ideal. Flowering commences in mid summer and continues on into early autumn. All species are sensitive to frost. All species are poisonous. Pruning Iochroma is simple as these plants respond well. Simply cut back to shape and remove some of the older canes each winter. Some gardeners hard prune every year to maintain a smaller bushy shrub. 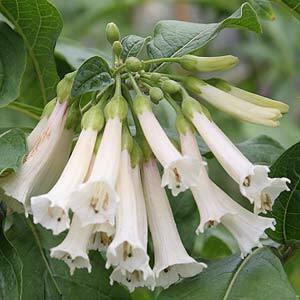 A number of species are available for sale, however it is some of the newer introductions that have the white flowers. And yes they are poisonous as well. Iochroma are related to Brugmansia, and require similar growing conditions. I. cyanea, fantastic flowers and lovely felty leaves, but this one from South America is a poisonous plant. I. warscewiczii is a large evergreen shrub with purple tubular flowers. I. grandiflora with its large felted leave and extra large clear purple flowers is an excellent foliage plant.